Since announcing the tour I've been inundated with questions and advice. All of which is lovely... but I'm really not very well equipped to deal with much, if any of it. A lot of people don't seem to believe me when I say that there's no real plan in place. It was an idea for a bike ride. Then I added in the idea of doing a gig every night. Then the gigs were booked. Then we announced the tour. But that's it. That's all I know. I haven't mapped out any particular routes. I don't know the ins and outs of how I'm going to get from A to B (to C to D to...) I don't know where I'm staying, what bike I'm going to use, whether or not anyone will be accompanying me, whether or not there'll be a support vehicle coming along as well or... well, or anything really. I genuinely don't. I just know that I'm doing it. I can tell you that I've rejected the idea of a documentary. I'm very proud of America Unchained but one of the results of making the doc is that people assume that the events only happened in order to make a film. People don't realise they're doing it, but as innocent - and perhaps natural - as the thought is, it stirs a smidgen of cynicism into proceedings that doesn't deserve to be there. I think a fair few people who might well have enjoyed the book have decided that, having seen the film, they know the whole story... it's just that stuff I did in order to make a film isn't it? It isn't. It wasn't a "job" I took on... it meant more to me than that... it's just I allowed a film to be made about it. I don't want people to be as cynical about this bike ride. It's something I want to do for myself. It's not a show about cycling... I'm just cycling to some shows. And I'm pretty confident I'd sell tickets for the show without the cycling. But if I was to make a doc about it... well then somehow, something beautiful would be stripped from it. I've learnt that it's impossible to convince an audience it would be happening anyway... if it's on telly it must have been done for the express purpose of getting on telly, right? Wrong. But seeing as that's how people feel, I've decided to turn down the opportunity to make a doc. Less people will hear about it. Those that do will know less of the details. But they'll know more of the spirit of it. Because it just is. Loads of people have been in touch to recommend a route or to ask if they can accompany me. The answer to all of this is... I can't plan that far ahead. I'm not going to make an appointment to meet and ride with a stranger months in advance because I have no idea what I'm going to feel like when it's happening. Maybe I'll want to be by myself. Maybe I'll be craving a companion or two. If you ask me the day before a particular leg, I'll know how I feel about it. If you ask me before that... well the answer is always going to be, I don't know. I can't pretend that I'm not scared of the physical challenge. It's a hell of a thing. It seems far more scary for having made it public. I genuinely hadn't appreciated how much harder I've made it by adding in the gigs. Riding from the southernmost point of the mainland to the northernmost, via the easternmost and westernmost points is one thing. If it was just that - just the journey - then it wouldn't have mattered if I took 6 weeks instead of 4. If I got tired and took a day off. Or just decided to call it a day 20 miles shy of that day's target it wouldn't have mattered. But when there's an audience waiting for you at the other end there's no choice. You have to complete the journey. It has to happen to a timetable. I have to get there every day. And when I get there, there's a mental challenge waiting for me, stretching out the day even further. I've been cycling in my day to day business, getting myself in and out of town, but that's just pootling. It doesn't compete in terms of distances. So on Thursday afternoon I decided to go for a proper training ride. I headed off into the Lea Valley and just kept going. I love London when the sun is shining. I love seeing crowds of people using the parks. I don't remember seeing that in my hometown of Stafford. The only people I remember seeing in the park were teenagers drinking cider and the occasional dog walking gran. Maybe it's because most people there have gardens - and most people with dogs will head for the wide open spaces of Cannock Chase. Maybe people use parks in London because they have less options. It doesn't matter. Whether it's because of the relative rarity of London gardens, or for some other reason entirely, there's still something really refreshing and energising about seeing public space so well used by the public. Anyway, I rode out to somewhere near Broxbourne in Hertfordshire. Out past the pages of the A-Z, under the M25 and beyond. It was beautiful out there and it was agorgeous day for it. I'd have kept going but I had my eye on the clock so I turned round and came home. It turned out I ended up with a 36 mile round trip. I feel fine after. And momentarily, I feel just that little bit more confident about the tour. You can do it Duffy Moon. Lovely that you were up in my neck of the wood - Broxbourne. Well I say that, but it's a good cycle ride from where I live. Anyway, I'm both envious and scared of what you're attempting. The cycle ride would be just about doable. It's the "and then I perform" each night bit that would get me. Anyway, a few months to go and getting on for 40 miles is passing by harmlessly, so you're definitely on track. That exercise bike is obviously working, although you can't beat proper rides, particularly if there are hills involved (and that's something the Lea Valley is notoriously poor for). I think it would make a great documentary. Vicky Park, represent! Do you remember the drunk with tattoos on his face that needed twenty pee for a cup of tea and you needed all your teeth? @smirrh: I agree that it would. But as cynics would then think, "Oh he's only done that cycling thing in order to make that doc and get on the telly..." I don't want to do it. I don't see any way of persuading people otherwise. The moment the tour was announced I had e-mails from people with a world-weary tone that made mention of the "inevitable TV spin off"... and as I'm not doing it for that reason and want to hold on to that for myself I've decided against. Well I think the inevitable coffee table photo diary book will be just as lovely. Nice tour Dave! 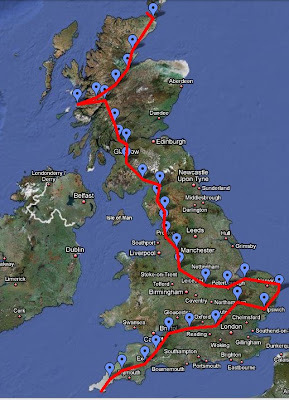 Last summer I did Land's End to John O'Groats for fun and it took us 16 and a half days of cycling. 6 weeks for your tour should be doable then. A bit of a detour, but you've got lots of days to make up for it, even if you do a smaller amount of miles each day. Is that a dog walking gran (in Stafford) or a dog-walking gran ? Two very different things. :-( Oh go on dave, we want to watch it, sod the other doubters! I need something good to watch on tv. I have started cycling too recently, great fun, did 30 miles myself, you might have a sore arse. You will have no problem. It is the equivalent of 4 hours manual labour a day. A couple of years ago a group of friends in our 30s,40s and 50s cycled to Edinburgh in 3 days (roughly 130 miles per day) and we were all regular pub goers. If you start each day at 8 you will be at your gig at lunchtime or late afternoon at worst. Dave, I think it would make an excellent, and interesting documentary. It seems weird that some people who enjoyed your other works, are the ones who don't seem to want you to do this one. I hope you reconsider and make the documentary.I would watch. A friend and i cycled from Austria to Belgium a couple of years ago. Cycling's an amazing way of seeing a country, fast enough to cover a lot of ground, but slow enough to actually experience the ground you're covering, and if you want to look at the scenery as you travel, you don't risk a high-speed out of control catastrophe. My only advice, check the handlebars don't press on your hands too much. I spent the second half of my trip with pins and needles in my little fingers as the blood supply was restricted by leaning on my hands all day for four weeks. Or get padded gloves. Hello Dave. Here's hoping your trip is enjoyable - best of luck! Five years ago I cycled about one hundred miles through the Negev desert, from Eilat to Masada fort. The extreme heat and dust had nothing on the pain I felt when taking a celebratory dip in the Dead Sea after finishing the journey - as soon as the salt water hit my open 'saddle sores' I screamed like a baby. Still, I'm very proud that I managed to cycle all that way, it gave me a real sense of achievement. What will happen if you /don't/ manage to make it to a venue in time? Just say, there was a major problem with the bike? As someone with a possibly unhealthy obsession with the U.S, i loved the unchained book, and the documentary (getting the DVD). I can understand your concern about people thinking the events allowed you to make a decent documentary, and rather the journey allowed the documentary to happen at all. Those last paragraphs of the book, i felt the same just leaving NYC so after travelling so far and experiencing so much, i'm not surprised you felt sad. I would love to do what you did. Looking forward to seeing how you cope. It's 'fewer' miles, 'less' mileage. As your editor will no doubt tell you that when the inevitable book goes in to pre-production.